For many years, I had a refrain which I gave as advice to each client I worked with: “Your software developers are expensive, so try to shift work away from them.” Ideally, software developers should only do work that relies on skills that no one else has. If a task can be done by a graphic designer, then it should be done by a graphic designer, because generally graphic designers are paid less than software developers (obviously not in all cases, but most of the time). I co-founded a startup in 2002, and I stayed with it till 2008, and we ran a team of 8 people using this principle: push work to the less skilled people, if they can handle it. Save the tough stuff for the computer programmer. We had great success with this style of work. This advice is still good advice, but the areas where it can be applied have shrunk, because new technologies simply require more software developer expertise to use. An obvious example would be what happened on the Web between 2005 and 2015, where we transitioned from using HTML/CSS to instead building systems with React/Relay or Angular or Vue. In 2005 it was easy (for a software developer) to offload a lot of work to graphic designers, in a way that is no longer possible. On an individual level, I freely admit I’m guilty of this. Sometimes a co-worker asks for advice, and I give them advice, and they still can’t figure out how to deal with their problem. So I get frustrated with their lack of skill, so I take over their task and do it myself. That gets the job done in the short-term, but in the long-term that is an unhealthy habit. In the long-term, it is better if the most experienced people can teach the less experienced people, so in the future the less experienced people will be able to solve their own problems, without needing any help. However, I’m not going to talk about individual cases of specific computer programmers giving themselves too much work. My focus here is only on cases where I see widespread, structural problems that are effecting all of business. In the title of this essay I’m putting all of the blame on elite software developers, but I’m being a bit unfair. If they were behaving badly, without any support from their managers, then they would be fired. In every case I will discuss, top management is complicit. I think what often happens is the top programmers say “We could do this thing, and it would be amazing” and the managers are desperate for a silver bullet that will solve their problems, so they don’t ask any tough questions, they just go along with the programmers. In other cases, especially computer security, I suspect management is the source of the problem, and the computer programmers are merely complicit. There is plenty of blame to go around to everyone. I worry that some people will think I am contradicting myself. 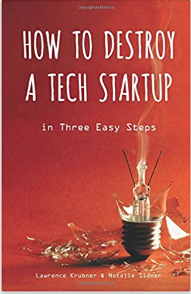 In How To Destroy A Tech Startup In Three Easy Steps I complained that management didn’t listen to the tech team enough. Am I now complaining that management listens to the software developers too much? Not exactly. I’m saying that sometimes management wants something magic to happen, so that all their problems can vanish like a puff of smoke, and some software developers then say “I am a sorcerer, and I can make magic happen.” Management listens when software developers are saying exactly what management wants to hear. That is not the kind of “listening” that I want to encourage. I think businesses would be healthier, in the long-term, if we could have conversations that are a lot more honest than that. After this disaster was well known to the public, EquiFax hired ReliaQuest to manage their server security. I have friends who work at ReliaQuest, and I know it is a great company full of great people. If you need a company to simply watch your servers and warn you about intrusions, ReliaQuest is a great choice. All the same, one can not outsource one of a company’s core functions, and for a firm that deals with sensitive financial data, security needs to be a core function. It is reasonable for EquiFax to outsource the janitorial service, but not the management of data. I’ve been researching EquiFax. As near as I can tell, hiring ReliaQuest is the main thing they’ve done to improve security. Perhaps it is the only thing. If a company handles people’s sensitive financial data, then I would like the CEO to be the type of person who wakes up in the morning thinking about security, goes to sleep at night thinking about security, and never has security far from their mind during the day. So to hire a security company, and then act as if security is a solved problem, is troubling. There are many other ways for a company to be hacked. Social engineering is a danger, and most company hacks are inside jobs. Hiring a firm such as ReliaQuest does not protect you from having one of your own employees steal data and sell it to the Russians. Protecting against internal attacks requires hard thinking by the top leadership of the company. The job can not be outsourced. But I don’t mean to only focus on EquiFax. I’ve seen many small companies where computer security was considered the exclusive job of the tech team. I recall a jewelry manufacturer in Richmond, Virginia, which had about 100 people, including a tech team of 3. Top management of such a company has the option to educate everyone about the importance of security, or they can just leave the task to the tech team. The tech team is often happy to gain the power granted by being in charge of such an important function. And then they implement silly rules, like forcing all passwords to change each week — minor rituals that annoy a lot while offering little real security. Real security could only come from educating the staff about the open nature of email, the importance of using encrypted communications, the importance of protecting the intellectual property of the firm. A company with 97 ignorant people and 3 security minded people can never be as secure as a company with 100 security minded people. I’ve been writing code professionally since 1999. The first few years, I didn’t work at a company that used version control. Colin Steele mentioned Subversion to me in 2005. I used it till 2011. Since 2011, every company I’ve worked at has used Git. I have never worked at a company that had the same needs as Torvalds. Never. I’ve never worked at a company that sponsored non-canon development. Every company I’ve worked at has a canonical repo for each app that is under development (or multiple apps in one canonical repo). I have worked at companies that implemented very complex Git strategies. For instance, when I was at Timeout.com they insisted that every developer create their own repo for each app, and do code review on their own repos, and then after code review push their branch to the canonical repo and open a pull request. While this was all possible, and we all followed the rules, there was no gain. It was a lot of rituals and complexity without any benefit. Occasionally we would each make some minor mistake, such as pushing to “origin” but forgetting to push to “upstream”, and then telling the QA team that they should test our new branch, and the QA team replying with “We can’t find your new branch, are you sure it exists?” because of course they are looking at “upstream” and we only pushed to “origin”. Minor, but annoying, and what were we gaining for this extra trouble? The funny thing is, the company still had repos that were clearly canonical. We weren’t building Open Source software. We weren’t Torvalds. We were a company that had to deploy proprietary software to servers that we controlled. We gained nothing from the distributed nature of Git. Nearly every place I’ve worked would have been better off with Subversion, as it would have allowed smoother workflows integrating the work of the whole team, in particular the non-technical staff (graphic designers, QA team, HTML/CSS frontenders). Over the years, I’ve learned this rule: branches are for computer programmers. Non-technical staff tend to be terrified of branches. And this tends to make Git off-limits to non-technical staff. Git is strictly for computer programmers, and thus it helps contribute to the trend that I’m warning about, of too much power accumulating in the hands of the software developers, when a healthy workflow would spread as much of the work as possible to less skilled staff. Back in the 1970s, when my mother was in graduate school, she studied computer programming so she could build simulations of the urban transportation issues that she was researching. Her professor was a woman. At the time, that wasn’t especially surprising. If you’ve seen movies like Hidden Figures, you are probably aware that the computer industry was initially welcoming to women (at least, relative to other industries, and probably more so for whites — while the movie focuses on the difficulties the women face, at end of the movie, the women have all made giant strides into the new profession). 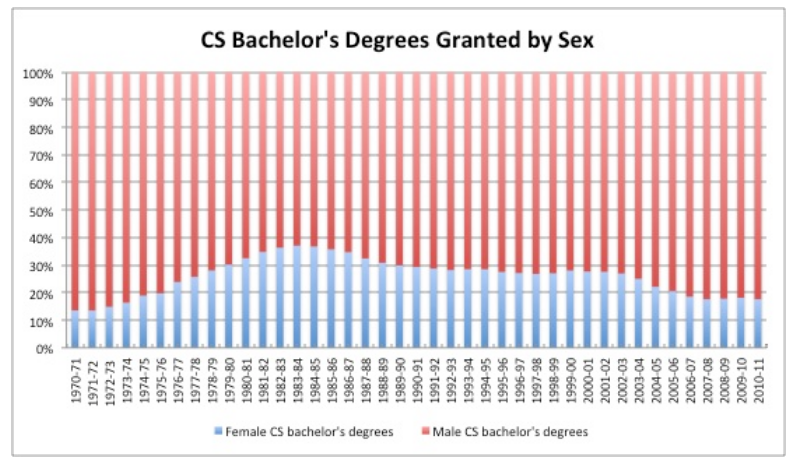 Women now make up 50% of all new doctors and more than a third of all new lawyers, but there are actually less women graduating with advanced degrees in computer science than there were in 1989. Women are clearly willing to work extremely long hours at work that is intellectually demanding, so as to get into high paying professions. But they are not willing to make the effort for a profession that doesn’t want them. Is this trend an example where the arrogance or power-grabbing of elite programmers are a problem? Only the passage of time, and some in-depth studies, can answer that question, but we can say that there are some programmers who certainly use their influence for evil, and it is up to the rest of us to try to balance out the pressure they exert. No doubt the retreat of women from tech is a complex and multi-variate trend, whose driving forces can not be fully understood at the moment. So what can we do right now? We can call out those specific instances where computer programmers have behaved badly. James Damore and Eron Gjoni are exemplars of the worst kind of behavior in the profession, so I’ll talk about them for a moment. Suppose there was overwhelming evidence that 95% of women were terrible at technology and 5% of women were awesome at technology. There are roughly 7 billion people on the planet, roughly 3.5 billion women, roughly 1.5 billion women who work outside the house for a wage. In this scenario, where only 5% of women love technology, there are 75 million working women who are awesome at technology. According to the Bureau Of Labor Statics, the USA had 1,256,200 software developers in 2016. The BLS also tracks some other minor categories, such as Web Developer, which have about 150,000 jobs. Lump all the sub-categories together, and let’s say there are 2 million such jobs in the USA. Let’s be wildly generous and double the number for the EU, and triple it for Asia. That gives 12 million software developer jobs in all of the advanced and developing economies. So even with exaggerated assumptions about women’s inherent weakness in technology, we still end up with a scenario where every single programming job in the world can be filled by a woman who will be awesome at the job. There is no need for men, at all, in the tech industry. One of my pet peeves is people who indulge in lazy just-so “evolutionary psychology” arguments and yet they still believe themselves to be hyper-rational. James Damore seems to fall into that particular vice. In his essay, he constantly references studies that found some interesting preference for women that was different from men, then he treats the mode of that distribution as if it applied to all women, as if Google routinely hired the mode of any distribution. Does anyone think that Google hires the mode of the nation’s IQ distribution? Damore deserved to be fired for bad math. And of course, Eron Gjoni is not an elite programmer, but he also is not a credit to the profession. While his crusade against Zoë Quinn might not be the norm, the fact that it started a movement suggests there is some pent up rage looking for an excuse to express itself against women. What is the difference between the 35% of 1990 and the 26% of recent years? Accepting the rough 2 million figure, you have to assume that at least 180,000 women are missing from the tech industry. But that implies that the 35% was somehow the magically perfect number. If you assume that the tech industry should achieve gender parity, as the medical profession has, then there are almost 500,000 women missing from these technical jobs. Therefore this issue is much more urgent than the other 3 issues that I mentioned above. The productivity hit from missing out on 180,000 (or 500,000?) talented people, is much more significant than the damage I see from having the wrong philosophy regarding security, or version control, or user interfaces. Both top management and top computer programmers need to re-think their positions. It is understandable that computer programmers might enjoy the increase in power and prestige that comes from a change of process or technology that makes them even more necessary than before, but it is bad for business productivity. As much as possible, elite staff need to delegate, and that includes elite computer programmers — as much as possible, we want them to delegate work to others, and we want the leadership to support them in this. And both the leadership and the programmers need to think carefully about the real cost of adopting a technology or process that makes it impossible for less skilled staff to do work. I’ve observed exactly the opposite dysfunction at many companies. The programmers are used as general workers and many tasks are offloaded on to them by more “important” people. It’s not economics, but a reflection of social standing. This is not so much startups but larger and more established companies. “By Just A Programmer”, thank you for writing. I think we agree that top level programmers should be focused on delegating work to those who can handle it? That top level programmers should be reserved for those tasks that only they can do? Sounds like we agree on that? I agree that in large non-tech companies, the programmers are often treated as serfs. I’ve seen that dysfunction, though I invite you to offer more details about what you’ve seen. However, the programming elite at the tech companies are very much taking us all in the wrong direction. They are dragging the whole industry with them, towards a world where programmers are needed for more and more tasks. I’d like to see more the opposite.